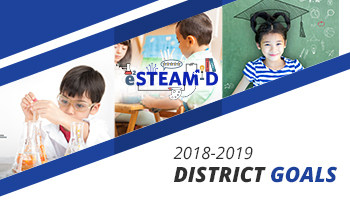 At the AESD Learning Link, we support learning in all of the important areas that your child needs to grow to be healthy and ready to succeed in school life. Early education, language development, parent and child interaction, health and wellness and family support are all “linked” together in this unique and comprehensive program. The Learning Link provides an open and flexible schedule where parents join along with their child in interactive learning through play. The classroom and outdoor environment are designed for hands-on exploration by infants and children with guidance from the preschool teacher and their parents. Children receive health screenings, referrals and services through our preschool health team. Parents receive one-on-one consultation with professionals who will provide information about how children learn, the school system and other community agencies that are available for family support. The AESD Early Childhood Education Learning Link is a free program for parents and children ages 0-5. A parents and up to two children 0-5 may participate in this early learning environment. 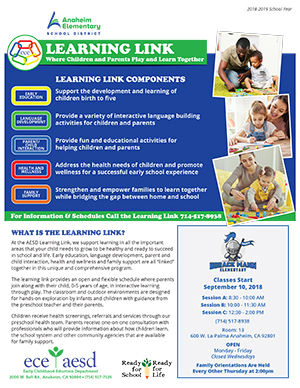 Download the Learning Links flyer.